In an attempt to distance itself still further from Java, Apple released a Mac update Wednesday which removes Java plugins from any web browser running on OS X. 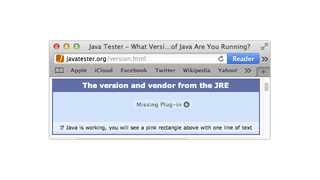 Users that choose to install the update will stumble across the warning above when they try and view web content that requires Java. One way around the problem is to install the official Oracle Java runtime package on the computer in question. Arguably, it could be seen as a sensible move: Java is particularly vulnerable to attacks, and removing it decreases the number of routes a hacker can take to infiltrate a device.